Tim Rajeff: I was born in San Francisco in 1959 and as soon as I could walk began hand lining off the docks and piers with shrimp to catch perch, smelt, or if you were lucky, a rock cod. We spent summers on the Russian River with our Russian grandparents. It is there that we learned how to make my grandfather’s secret cornmeal dough ball recipe. There were a lot of trips to the Sierra Mountains and Oregon, where the whole family would spend time on the rivers fishing for trout. Because we lived near the famous Golden Gate Angling and Casting Club, my brother and I got interested in competitive spin and fly casting. My brother was a natural and dominated the sport of spin and fly casting since his early years in the sport. I was the younger goof-off until I decided to give him a run for his money. I the mid-1980s I managed to win the single-hand distance casting at the world championships and was the national overall fly casting champion. 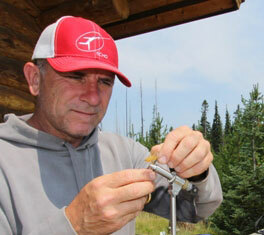 Tournament casting was a great place to test cutting-edge rod designs and casting styles. It became clear to me back then that fly fishing was going to be a large part of my life. I started guiding in Alaska in early 1980s and ended my guide/lodge career ten years later after developing a couple Atlantic salmon lodges in Russia for Gary Loomis. When I retired from the fishing lodge business I went to work at Gary’s fishing rod factory where I became the head of the engineering department. At Loomis I was able to work with my brother Steve on new rod designs where I was especially interested in fly fishing rod design. If you count the work I did custom making the distance rods I used in competition you could say I have been designing fly rods for over 35 years. TR: I don’t think I have a specific design philosophy. Every rod is different and requires different action and power, but I think you could say that I design each rod for people to have fun when they use it. We are all different in our casting style and body type, and where and how we fish. When I have done my job, people should be able to forget they even have an ECHO rod in hand. Ideally, the rod should place the fly exactly where you want it – without you having to adjust your cast to fit the rod or without having to use extra effort to make the cast. I guess my philosophy is similar to Sir Henry Rolls, “Strive for perfection in everything we do. Take the best that exists and make it better. If it doesn’t exist, design it. Accept nothing nearly right or good enough. The quality will remain long after the price is forgotten.” My rods are designed for you and where and how you fish and cast. The reason I am so excited to wake up each day and head to the office is my passion for making a great rod, reel, or line. When I’ve nailed it, I hope my efforts will put a smile on people’s faces. RM: What’s on your mental radar when you set out to design a new fly rod? TR: When I design a new product the first thing is to know the experience and skill level of the person who is using the product. For a new rod design, my check list is to know the environment the rod will be used, the distance of the cast, the size of the fly, critical factors the angler has to overcome like wind, species of fish, and durability. Then I design the correct action and power that will optimize the fishing experience. The other factors of a rod that I have to mix into the design are the rods break strength, the weight of the rod, the components (handle, guides), the cosmetics , the warranty, and finally what the target cost the rod needs to be. RM: Has your particular casting style influenced the way you design fly rods? TR: One of the reasons I feel comfortable designing so many different types of rods is that I have been casting since I was a boy and have a pretty generic casting style. Like any good casting instructor, I have taught myself to make good casts with many different casting styles and to do with both hands. So my personal casting style doesn’t determine how the final product turns out. TR: Yeah. Rods that involve more modest casting distances and where a person would make more false casts are easier to design. For example a light, 9-foot 5-weight rods that are designed to fish in “average western rivers” to perform over a large range of fishing conditions and or casting styles tend to have a more modest action and power. These types of rods have a larger range of acceptable performance (tolerances) than more extreme rods that have a very narrow performance windows. For instance a 10-weight saltwater rod that is optimized for an athletic 25-year-old guide who lives in the Keys and fishes 100 days a year and can bang out 100 foot casts with no trouble might be dramatically different from a 10-weight rod in the hands of a more slight person who only fishes 1 week a year. It is my job to know exactly who is using the rod and use my experience to adjust the design to help everyone who grabs one of our rods to have more fun on the water. RM: When you read customer feedback, what is/are the most common misconception(s) they have about fly rods? TR: When I hear from consumers that are unhappy or struggle with a fly rod it is because the action and power of the rod doesn’t match their casting style or fishing conditions. We all want to hit the same golf club Tiger Woods hits, but unless you have his same style, hand speed, and have a similar physique – you might do better with a different club. We all like to see a cast go a long way, but it is important to note that for trout fishing, most of our casts are under 40 feet – and yet when standing in the parking lot of the local fly shop most people will see how far they can throw a rod. Rods that cast far tend to be stiffer and will not be a fun and easy rod to make a short cast with. RM: How does ECHO differentiate itself from other manufacturers? TR: We use our extended family of fishing friends and combine it with my fishing, casting, and rod design experience to make affordable, innovative rods that feel like an old friend the first time you cast it. We don’t make doggie pillows, have 100 employees, or spend time designing and marketing a pile of different gear. We support the small fly shops that are the backbone of our industry and ultimately we are just a small group of dedicated fishermen and women hunting for the next things that help people enjoy every moment they have one of our rods in their hands. 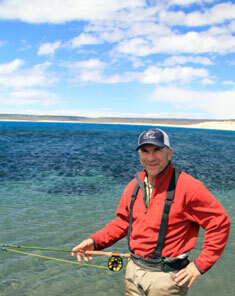 RM: Is there anything you’d like to say about the ECHO BOOST fly rod? TR: BOOST rods were designed with more power than most of our other rods to take advantage of a trend in the way people cast a fly rod. In years past when rods were heavier and softer people developed longer smoother casting strokes. In recent years, people have changed their casting style to one that is a little more aggressive and condensed. If you like to use a slightly more aggressive cast, these rods will tend to throw fewer tailing loops and will generate more line speed than slower, softer rods. I kept the tip light enough to initiate a cast with less line out and the extra power in the bottom half of the rod is where the line speed and fewer tailing loops come from. We did this with intermediate modulus material so that you get more bang for your buck. Tim’s claims bear out: the BOOST rod is tailored to those with a more aggressive casting stroke. And if you’re partial to over-lining your fly rods – this fly rod is the perfect candidate for that, it will pair well with slightly heavier-rated (usually by a half-size) lines that most fly line manufacturers currently offer. I found the BOOST’s main attribute to be its impressive swing weight: the rod was designed with a very generous mid-section, much of it responsible for the rods overall power. That said, by using the intermediate modulus, the BOOST still allows for a reasonably sensitive upper portion. I also really liked the matte charcoal blank colour chosen for the BOOST. Can’t get much stealthier than that. 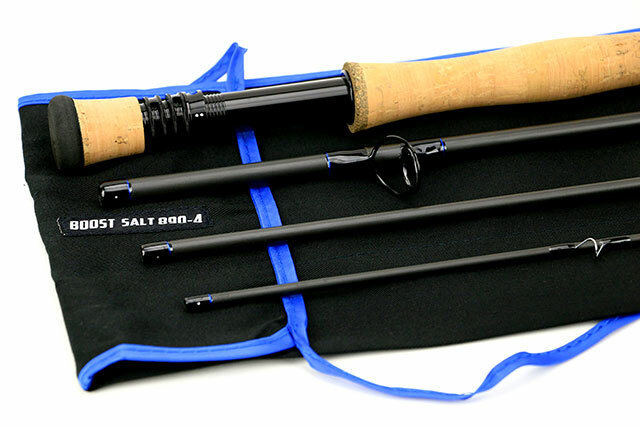 Finally, the BOOST line of freshwater rods tops out at $229 – a surprisingly low price when you consider the blank and hardware package offered.